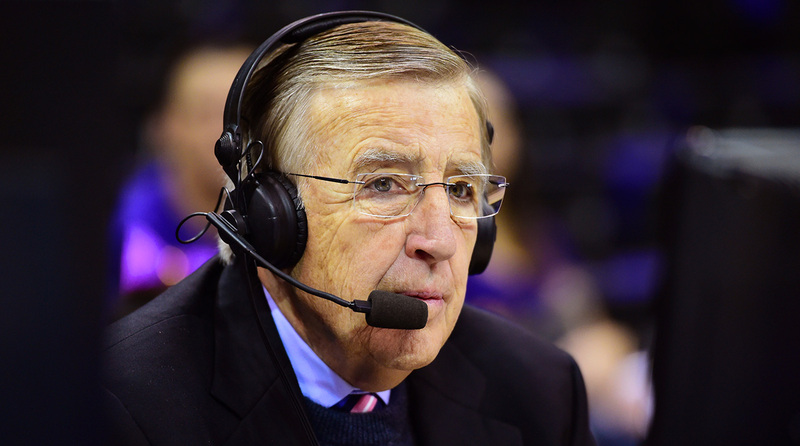 Ahead of his final broadcast for ESPN on Tuesday night, Musburger discusses his history with the network and his new job fronting a sports gaming media network. His next act will be hosting a two-hour show, Thursday through Monday, for a new network called VSiN (Vegas Stats & Information Network). The company describes itself as the first multichannel network dedicated to sports gambling information, and will be available via web, live-streaming, radio, mobile and social. Musburger and other hosts—including the respected boxing announcer Al Bernstein—will broadcast from a custom-built studio in the Sports Book of the South Point Hotel Casino and Spa in Las Vegas. The new network includes oddsmakers Jimmy Vaccaro, Vinny Magliulo and Chris Andrews. Brian Musburger, Brent’s nephew, is the founder and chairman of VSiN. VSiN will launch on SiriusXM radio (Sirius channel 215, XM channel 204) and on the SiriusXM app (channel 961) nationwide on Feb. 27. It will air live programming five hours a day, seven days a week. On Sunday, Musburger will host a special early edition of his show, My Guys in the Desert, on SiriusXM Rush (channel 93) from 3–6 p.m. ET. Musburger said his nephew came to him with the idea of the network when they were together in Las Vegas in 2015. Brent then introduced Brian to Vaccaro, an oddsmaker at South Point, as well as Michael Gaughan, who owns the hotel. Brent Musburger then moved away from the project, but his nephew came back to him again early in 2016. “I told him it has to be on solid footing for me to think about it because I have a long-term deal with the folks at ESPN and the SEC Network,” Musburger said. “Then last fall, Gaughan started building a studio at South Point. That’s when it became serious. I saw the studio was a big-time studio and adjacent to a sports book. In an interview with SI.com on Sunday, Musburger made it repeatedly clear that he was not forced out by ESPN, nor was this related to his comments about Oklahoma football player Joe Mixon during the Sugar Bowl—those comments were widely criticized as insensitive, including by some ESPN colleagues. His final ESPN telecast is Georgia at Kentucky at 9 p.m. ET on ESPN. “We had already started the process of me leaving,” Musburger said. “The morning after the Sugar Bowl I had breakfast with [ESPN president] John Skipper and [senior vice president of event & studio production] Stephanie Druley, and they wanted to work out a plan to keep me at ESPN. There was not even a discussion about what had been said specifically about Mixon. In fact, the only person who mentioned it to me was a telephone call two days later from [Disney chairman] Bob Iger, who is an old friend, and he said, ‘This too shall pass.’ That was the only comment. There was no blowback. There is absolutely no connection. Musburger’s sons have lived in Las Vegas over the years and he says he has a lot of friends in the city. He will move later this year to Las Vegas but will keep a property in his beloved Montana.